Are you an experienced trucker looking for more challenge and advanced technologies? Are you a player looking for more control and interaction? Are you a fifth wheel that didn't get to play? Or do you just want more fun and destruction? Then this expansion is for you. It consists of several parts that can be used separately or in combination to enhance your flights across the galaxy. ship building components with new and hitherto unheard of technology, as well as figures and specialization cards for a new alien species. pieces and rules for 5-player games. boards and special rules for ships of Class IA and IIA. new adventure cards that players put into the deck themselves to keep things interesting for their fellow truckers. brutal cards that can turn your transgalactic pleasure cruise into a trip through hell. a few special adventure cards to spice up the original set. 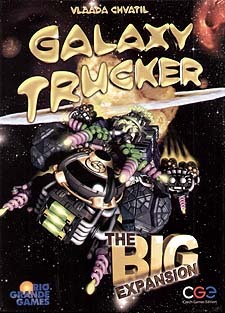 After having played Galaxy Trucker since its release and thoroughly enjoyed playing it, getting this expansion was simplay a must have. Yes it is expensive, but you do get a lot for your money - not only does it allow a 5th player to join in, but you simply get prety much more of everything. It even includes a proper version of its print n play Rough Roads mini expansion which all makes this fun game into even greater fun. If you picked up a really early edition of the game though, these additions are slightly different in size to the original, but a fix kit will be available which resolves this. With so many extras though, these differences aren't really an issue though.